I’m sure it won’t surprise anyone to learn that this is my second post of this title in two years. OK, I gotta say it – don’t you wish we could send all members of the Federal government off on a Carnival cruise and hope the engine stalls at sea? 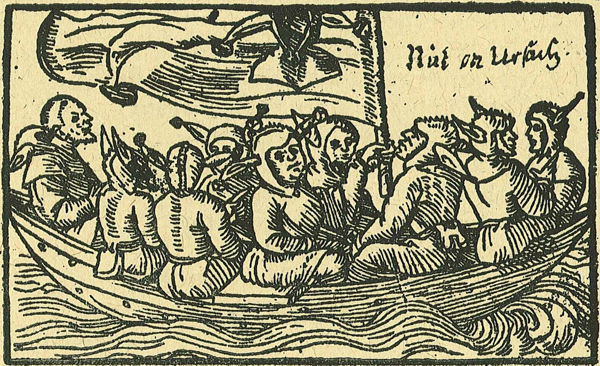 “Ship of Fools” has been a recurrent image in literature, art, and music for 500 years. Somehow it’s comforting to to know that folly and madness are nothing new, even – or perhaps especially – at the helm of the Ship of State. This entry was posted in Culture, Current Events, Politics and tagged 2013, Culture, Events, history, politics. Bookmark the permalink. Morgan, I know you and I have very different political views, but you nailed this one. Send them all out to sea and they will either learn to work together or die trying. Either way it will be a victory for the rest of us. I may have told this story before – or more than once, but during the years my family lived in Europe (ages 15-17 for me), I’d notice that some of the European or Mediterranean nations would occasionally hold a “vote of no confidence,” and if it passed, the entire government would be replaced. We used to feel so super – didn’t have crude elections like that in the good old U.S. of A! Now, sadly enough, I find myself wishing we had a provision like that – to replace them all with a new slate and start fresh! When I was studying psych, one teacher explained that the origin of the DSM was tests done for the army between the world wars. Something approaching 10% of troops suffered shell shock in WWI. By determining the right criteria and screening, it was reduced to 2%-3% in WWII. This research led to the Diagnostic and Statistic Manual which defines sanity in our culture – based on those attributes that make a good combat soldier! Or, I would add, a good corporate citizen. “What is madness but nobility of soul at odds with circumstance” – Theodore Roethke. Now Roethke clearly wasn’t talking about the Hannibal Lecktors of the world, but he makes a point. Thanks for visiting and thanks for the follow – a favor I was happy to return. From the time I was a teenager, during the Vietnam era, whatever administration happened to be in power has tried to equate love of country and love of its government. Total BS.